A Massachusetts bride gave her childhood friend and her family the gift of a lifetime at her wedding: a memory they would likely not otherwise have. Jessica Otto's dad, Peter Otto, has cancer for the fourth time. "He isn't doing well," Jessica Otto told ABC News, adding that he only has a month or two to live. 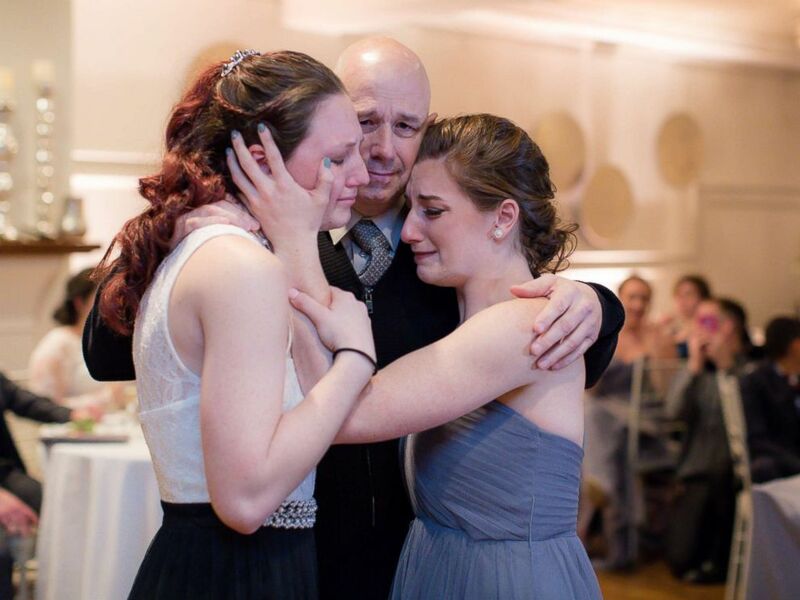 Michaela Cook-Yotts, who has known the Otto family since she was in second grade, said it was actually her now-wife, Nora Cook-Yotts, who had the idea to give Jessica and Peter their own father-daughter dance at their wedding. "When she met Mr. Otto, she fell in love with him," Cook-Yotts said. The couple presented the idea to Jessica Otto, who was "immediately down," said Cook-Yotts. "Deep down, I knew it wasn't in the cards for us," Jessica said. "It was everything to me, I don’t think they will ever fully know [what] it meant to me." Jessica Otto and her sister with their dad, Peter Otto, at the wedding of their friend Michaela Cook-Yotts. Her dad, Jessica Otto said, is her best friend. "He would give you the shirt off his back, the kindest person most selfless I've ever met," she said. To know that he won't be dancing with her, or her sister, who is currently engaged, at their weddings, is painful, she added. Jessica Otto and her dad have many shared interests, including biking, she said. They both participate in the Pan-Mass Challenge (PMC), an annual bike-a-thon that benefits Dana-Farber, where Peter Otto is being treated, and goes through 46 Massachusetts towns over two days. 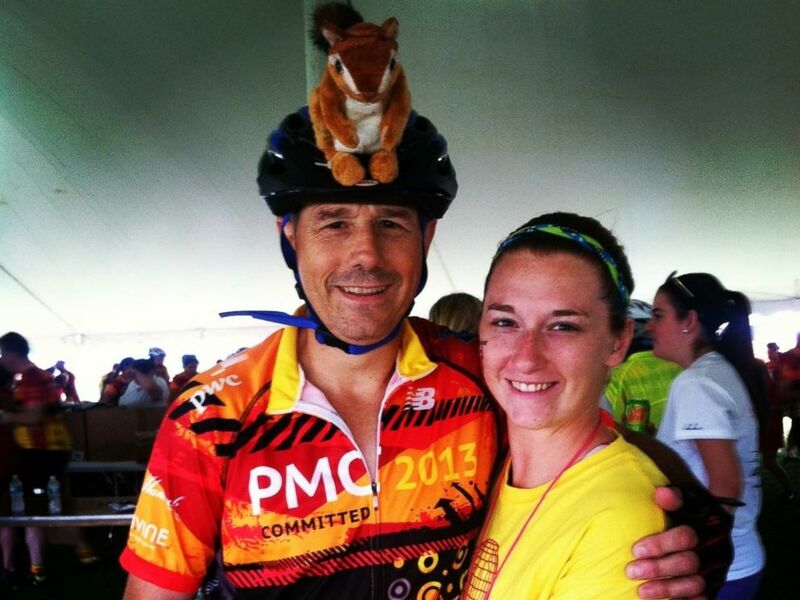 Peter and Jessica Otto at the 2013 Pan-Mass Challenge. The duo rode together in 2014 and 2015. This year, Jessica Otto will ride on Aug. 5 and 6 alone, as her dad is not well enough to join her. The father-daughter team have fundraised around their efforts in the past, hoping that the money might somehow benefit Peter Otto. Now, with the event coming up and her father in deteriorating health, Jessica Otto knows the money she raises won't help her family. "I used to go into this each year feeling really happy and positive," she said, "This year though, I have a lot of anger." Still, she said, she hopes her fundraising will make a difference for someone else and she'll continue to do it as a tribute to her father. "As long as my body will let me ride, I'll ride," she said. The missed moment of the upcoming PMC is one of the reasons memories like the one Cook-Yotts gave to the Otto family are so precious. The dance was a surprise for Peter Otto, Jessica Otto said. "They called our names and had us come up there and he knew," she said. Peter Otto and his daughter's danced to a remix version of "Every Breath You Take." "It was so selfless of them to take time at their wedding to give us this moment." "My dad is a man a of very few words, he doesn't express how he feels, he doesn’t say it but he shows it. He hugged us close to him," Jessica Otto said. Cook-Yotts added, "It was the best part of the wedding and I know Nora would say the same thing. There wasn't a dry eye in the house."